Basia Rose Designs grew from pop-up, now at 1617 W. North Ave. in Innovations and Wellness Commons. Basia Spencer. Photo by Ana Martinez-Ortiz/NNS. In 2015, Basia Spencer occasionally had some free time. She had recently given birth and was looking for something to do while her daughter, Violet, slept. Then an aunt gave her a sewing machine and helped her finesse her technique. At first, Spencer made blankets and bibs. Over time, she began to feel more confident and branched out into the fashion world when friends and family asked her to make them custom dresses. 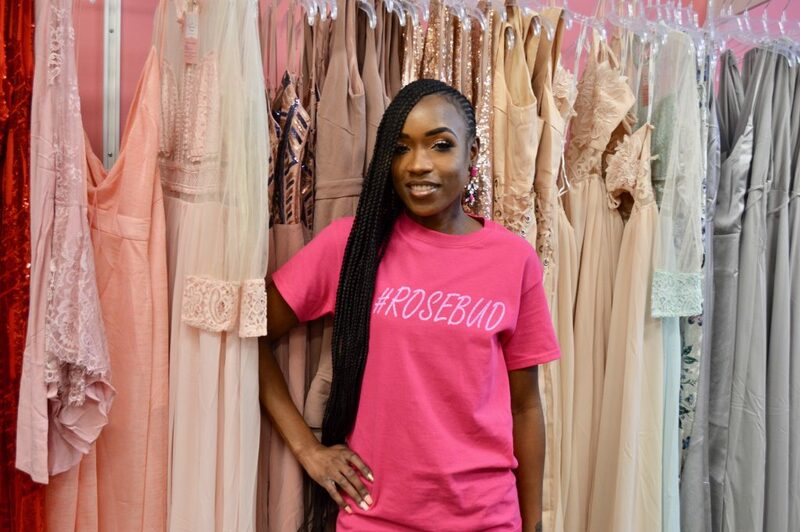 Her good taste in clothes and knack for design inspired her to open Basia Rose Designs. Originally, Spencer sold her merchandise online and through word of mouth, but in December she opened her own shop at the Innovations and Wellness Commons, at 1617 W. North Ave.
Spencer is the first vendor to lease the space, a former Outpost store that was the home of Pop-Up MKE during the summer. Various entrepreneurs set up shop for 30 days at a time, rent free, as part of the LISC Milwaukee program. Friends of Basia Spencer worked the runway and wore her designs during Basia Rose Design’s grand opening. Photo by Ana Martinez-Ortiz/NNS. According to Spencer, when she was in the pop-up shop, customers took an instant liking to her designs and often returned. Consequently, she was given an additional 15 days in the space. Spencer offers a range of dresses, blouses and skirts, most of which she designed herself. Her other services include tailoring and alterations. Her exploration into fashion and design began while she attended Bradley Tech High School, where she was voted “best dressed.” Her interest continued through her time at Milwaukee Area Technical College. “I always remember Basia staying on top of the fashion, even when we were back in high school,” said Spencer’s cousin, Nyisha Spencer. At MATC, Spencer founded and presided over the Fashion Club. In 2015, she graduated with a marketing degree and a focus in fashion. Soon after, she began working as a manager for TJ Maxx in the children’s and men’s departments. Still, she said her leap from high school fashion maven to boutique owner took her by surprise. “It kind of came unexpectedly, but it’s a good match for me,” Spencer said. An old friend from high school asked Spencer to make some matching pieces for a family photo. When the friend shared the photo online, it quickly went viral. Spencer recalled being surprised by the number of “likes” the photo received, but the attention encouraged her to become an entrepreneur. While preparing to open her own boutique, Spencer would practice on items she picked up from Goodwill. She began building up a clientele, partly through her job as a seamstress for The Fur Vault at Macy’s in Mayfair Mall. After she left Macy’s, she began working as a seamstress for Workroom Associates in Mequon. Many of her co-workers gave her advice on pricing items and tricks of the trade. Her aunt, Mary Spencer, taught her how to sew and mentored her when she was starting out. Mary Spencer admitted to being nervous about letting Basia use her sewing machines, but now passes down old ones to her. “She was very dedicated and would come all the way out to my house and allowed me to teach her some skills,” Mary Spencer said. Basia Spencer has set up areas for other vendors in the boutique. Daniel Reed sells hats and t-shirts he designs under the label Danny Warbuck$. His business started when he designed a hat to raise awareness for breast cancer, and the idea grew from there. Reed and Spencer met at Samuel Morris Middle School and have always supported each other’s entrepreneurial endeavors, he said. “It [Basia Rose Designs] is a great example for young millennials, especially young minorities,” Reed said. Beth Haskovec, commercial revitalization program officer at LISC, said she hopes that Spencer’s store is successful, so that she can extend her lease beyond a year. It also has the power to influence other business owners, she said. Milwaukee-based entrepreneurs are revitalizing neighborhoods and supporting one another, Haskovec added.